Amazon has retired all Amazon Music Storage subscriptions, so you can no longer use the Amazon Music app to upload music to your account. 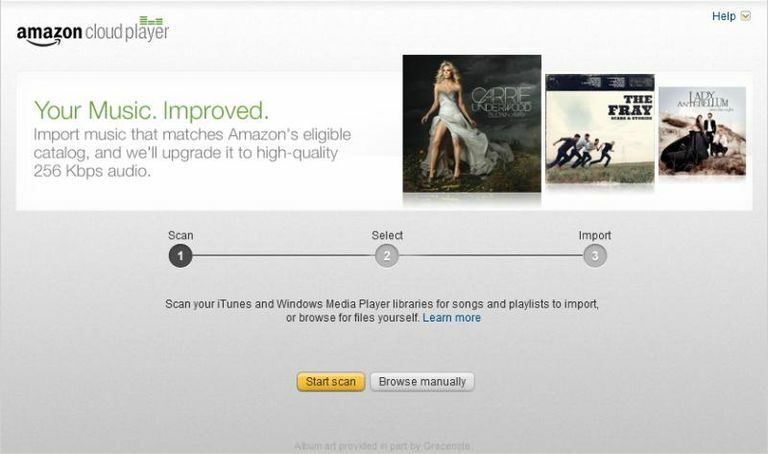 The information below describes how Amazon Music used to work. If you haven't used Amazon Cloud Player before, then it's simply an online service where you can upload music and stream it via your internet browser. To get you started, Amazon gives you free cloud space for up to 250 songs if uploading — if you purchase digital music via the AmazonMP3 Store, then this will also appear in your music locker space, but won't count toward this limit. Whether you want to upload songs you have ripped from your own audio CDs or purchased from other digital music services, these simple steps show how to get your collection into the Amazon Cloud Player. All you need is an Amazon account. Once your songs are up in the cloud, you'll be able to listen to them (via streaming) by using your computer's browser. You can also stream to iPhone, Kindle Fire, and Android devices. Log in to Amazon Music. Click your name from the left pane, and then click Download Desktop app. Another option you have for downloading Amazon Music is to click the link from the Amazon Music App page. Open AmazonMusicInstaller to install the program. The entire installation process is automated, so you'll know it's finished when Amazon Music opens. You're now logged in and can start uploading music to your Amazon Music account. Once you have installed the Amazon Music Importer software, it should run automatically. You can either click on Start Scan or Browse Manually. The first option is the easiest to use and will scan your computer for iTunes and Windows Media Player libraries. For this tutorial, we assume that you have chosen the Start Scan option. When the scanning phase is complete you can either click the Import All button or the Edit Selections option. Using this last option enables you to select specific songs and albums. Again, for this tutorial, we assume that you want to import all your songs into Amazon's Cloud Player. During the scanning, songs that can be matched with Amazon's online library will automatically appear in your music locker space without the need to upload them. Compatible audio formats for song matching are MP3, AAC (.M4a), ALAC, WAV, OGG, FLAC, MPG, and AIFF. Any matched songs will also be upgraded to high-quality 256 Kbps MP3s. However, for songs that can't be matched, you have to wait for them to be uploaded from your computer. When the importing process is complete, close the Amazon Music Importer software and switch back to your internet browser. To see the updated contents of your music locker you may have to refresh your browser's screen; hitting F5 on your keyboard is the quickest option. You can now stream your music anywhere just by logging into your Amazon Cloud Player account and using an internet browser. If you want to upload more music in the future, simply log into your Amazon Cloud Player (using your Amazon username and password) and click the Import Your Music button to launch the software application you installed earlier. Amazon Music: Is it the Best Alternative to The iTunes Store? Can Microsoft's OneDrive be Used as a Music Locker? Music Lockers: Do You Use One to Store Songs Online?